renovated building. The neighborhood features a number of bars, cafes, banks and live music venues. • Spacious open air terrace with snacks, coffee and drink machines. • Large reception with sofas and notice boards. • Social area and a library with graded reading books, guide books, magazines and newspapers. • 18 ample sized classrooms with ozone friendly, reverse cycle air-conditioning. • HIFI sound system in all classrooms. • Interactive whiteboards in selected classrooms. • Multimedia room where students can brush up on their Spanish by watching a film or TV series. • 8 computers with FREE internet access and FREE WiFi connection. The intensive Spanish course consists of 20 or 30 lessons per week, focused on the practical use of language. The 20 lessons are held in groups of max. 12 students, and if you book the course with 30 lessons per week, you'll additionally have 10 mini-group (max. 8 students per class) afternoon lessons to your Intensive 20 course, in which you are used to work on conversation, language skills, Spanish culture and additional topics. A double room is only available for two people travelling together during the same period. A € 150 deposit is required in shared apartments (refunded at the end of your stay when no damage is found). Treatment surcharges for half and full board are based on stays during high season (02/06/2019 -14/09/2019); if you travel outside this period, the surcharges might be slightly lower and will be ajusted on the final invoice/confirmation of StudyTravel. *Course materials are included in the price, except for beginners (who pay € 18 upon arrival for course materials). In 2019 the school is closed on the following holidays: from 01/01/2019 to 06/01/2019, 21/01/2019, 19/03/2019, 19/04/2019, 01/05/2019, 25/07/2019, 31/07/2019, 15/08/2019, 12/10/2019, 01/11/2019, 06/12/2019, and from 23/12/2019 - 05/01/2020. Missed lessons due to bank holidays will not be refunded or rescheduled. During the high season the school may have classes in the afternoon. The Combined language course in San Sebastian is an excellent way of complementing your intensive course with daily private lessons. You will have 20 hours per week in a group and a 1 hour one-to-one class per day. In the duo course you will have lessons together with one other person. The duo course programme will be based on your linguistic skills and will be adapted to your personal and/or professional needs. The duo course can only be booked by two people travelling together during the same period and who have the same level of Spanish. The one-to-one course offers you the opportunity to learn at your own pace according to your own needs. The one-to-one course consists of between 20 and 25 lessons a week. On request, we can organise lessons on Saturdays and Sundays, including lunch with your teacher. You can also form a private group if you come with friends who are at the same Spanish level as you. The D.E.L.E-course is a 4 week exam preparation course that consists of the intensive course with 20 lessons + 10 exam preparation lessons per week in mini- group. You can take the B1, B2 and C1 exams at the school. Please note that exam fees are not included in the course price. The prices for the DELE-course do not include the exam fee. Please contact us for more information regarding the exact exam dates. Do you also want to become completely “zen” during your language course abroad? Then perhaps the Spanish & Yoga course is the perfect option! This course includes an intensive Spanish course with 20 lessons per week plus 2 yoga classes per week. Yoga lessons are held in Spanish, meaning some basic knowledge of Spanish is recommended. This course includes an intensive course with 20 lessons per week plus 2 stand up paddle classes per week (normally held on Tuesday and Thursday). All materials are provided (board, paddle and locker). If there are not enough people to form a group, the number of hours per week will be reduced accordingly. The course is held at the famous La Concha Beach. It is also possible to combine this course with another language course than intensive. The stand up paddle course can be booked for a shorter period than the language course. Prices on request. This course is available from the beginning of June until the end of September. This course includes an intensive course with 20 lessons per week plus 2 kayak classes per week (normally held on Tuesday and Thursday). All materials are provided (kayak and locker). If there are not enough people to form a group, the number of hours per week will be reduced accordingly. Held at La Concha Beach. It is also possible to combine this course with another language course than intensive. The kayak course can be booked for a shorter period than the language course. Prices on request. This course is available from May until October. This course includes an intensive course with 20 lessons per week plus one surf class per day Monday through Friday with a maximum of 6 students per instructor. All materials are provided (board, wetsuit, insurance and a hot shower in the winter). If there are not enough people to form a group, the number of hours per week will be reduced accordingly. Held at Zurriola Beach. It is also possible to combine this course with another language course than intensive. The surfing course can be booked for a shorter period than the language course. Prices on request. The course is available all year. Surf materials (surfboard, wet suit, etc) are inlcuded. 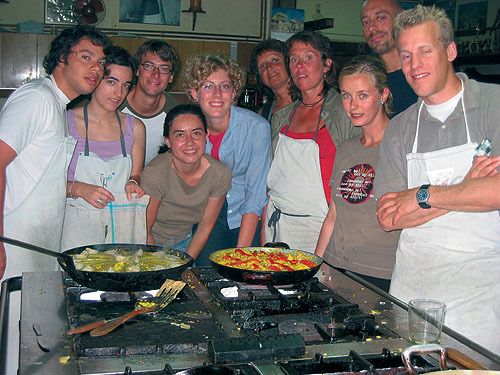 Get a taste of the local cuisine and traditions with a hands-on course in one of the local gastronomic societies. Run by a professional chef with a hands-on element in the preparation and elaboration of the 3 course menu. At the end of the class, you eat dinner with the rest of your classmates. This course includes an intensive course with 20 lessons per week plus the cooking course. It is also possible to combine this course with another language course than intensive. Prices on request. The residence is located at approximately 4 kilometers from the school. It consist of 222 rooms. In the residence you will be living with international students from the language school and also with Spanish university students. You can go to school by public transport or by bike (you can use a bike for free during your stay at the residence!). You will stay in a single room with a desk, wardrobe, small fridge, television, internet access and a private bathroom. Your stay is optionally based on bed and breakfast or on half board. Breakfast is buffet style. If you choose half board, you will get a 3-course menu. Every two weeks the sheets and towels are being changed and the rooms are being cleaned. In the meantime, you are responsible for keeping your room clean. There are washing machines in the residence which you can use, paying a small fee. The apartments are shared with students from the language school or with people living in San Sebastián. You will live together with 1 to 5 people, and can choose to stay in a single or double room. However, it is only possible to book the double room if it is shared with the person you are travelling together. The shared kitchen, common area, and bathroom are cleaned once in two weeks. Living with a family has many interesting aspects to bear in mind. It allows you to get to know the way that people in the country really live from the inside, as well as their customs, their cuisine and the way they enjoy themselves. It also allows you to practise Spanish outside school hours. 2 students of the same nationality will not be placed in a host family together.